So what is an Intelligent building? In the first place, the logic and communication between the different and diverse technologies used by the building must be ensured. These are technologies for the operation of buildings such as heating, cooling, air exchange, lighting control, shading control, lifts, but also fire and property safety. We can also include those technologies that contribute to increasing the comfort of the building's inhabitants. These include, for example, access and booking systems, control of audio and video equipment, individual zone settings according to the needs of a particular user. If all of the above-mentioned technologies interconnect, we will have created one whole in which we can already form dependencies and bonds. For example, let's link the heating and cooling system - the building simply does not allow the cooling system to activate when it's just heating up. But let's go back a few steps back and see what that connection means in practice. Individual technologies have historically emerged independently of each other, and it can be said that different communication standards, called communication protocols, have emerged separately in different technology areas. For example, with lighting the most common is the DALI protocol, for heating and cooling technology it is the BACnet protocol, M-bus is used for data collection and management. There are dozens of such protocols, but can we boldly say this area, that protocol? In recent years, the standards for wireless data transfer have increased, such as NarrowBand, LoRa, and Sigfox. We can really only talk about the Intelligent building if communication between systems and their protocols is ensured. 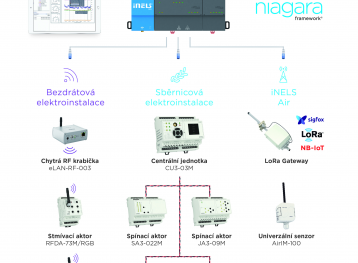 This technology interconnection has been has been focused on very intensively in recent years by the Holešov company ELKO EP, with the system called the BMS - Building Management System. BMS is a software environment in which it is possible to create mutual relations, visualize the activity of buildings technologies, collect statistical data and evaluate them. In this way you can find optimal building settings to ensure user comfort while enhancing the energy performance of the building. At the hardware level, ELKO EP offers the iNELS BMS unit, which integrates individual technologies within the building's cable infrastructure. The base unit also offers wireless technology connections. It is a unique device that allows tens of communication protocols to be interconnected. 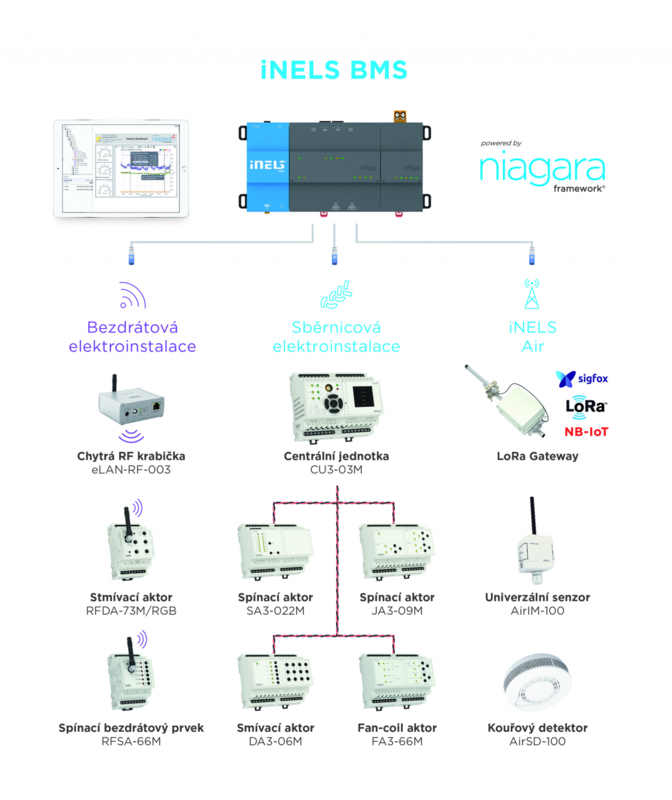 The iNELS BMS is also the device on which the building management software works. It allows local administration and building supervision, and also remote access through a web browser or a range of applications. Running the software, it can visualize events in the building, cope easily with the visualization of energy flow across the building or illustrates the air flow within the air conditioning. The unit collects data from connected systems, and then displays the data in graphs or as an export provides a comprehensive analysis of this data for further processing. As a result, ELKO EP is a leader in building management because it can offer its partners and customers solutions for managing large-scale buildings such as production halls, logistics centres, office buildings, hospitals, hotels, and even airports.